Image caption WH Smith says locations such as hospitals are "more complex environments"
WH Smith has been accused of exploiting customers at a hospital store after a BBC investigation found it was charging significantly lower prices on the high street. The retailer was found to be charging £1.89 for a 750ml bottle of water at Pinderfields Hospital, Wakefield, which was available for £1 in Leeds. Dewsbury MP Paula Sherriff said the approach was "fundamentally wrong". 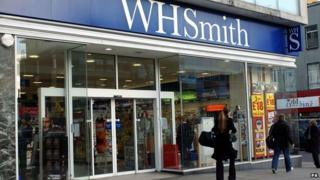 WH Smith said longer opening hours and higher costs were behind the pricing. But Labour MP Ms Sherriff, who worked in the NHS before becoming an MP and sits on the Health Select Committee, said patients and visitors were "effectively being exploited". She said shops had "unfortunately got a captive audience" at hospitals and added that the matter could be raised at the select committee. BBC Radio Leeds compared the prices of water and stationery items at WH Smith shops in Pontefract and Wakefield hospitals with the retailer's branch near Trinity shopping centre in Leeds. It found the 750ml bottle of water cost £1.49 in Pontefract hospital. Other items that were more expensive included a pad of A4 paper that was priced about 60% higher in both hospitals - £3.99 compared to £2.49 in Leeds city centre. The radio station also compared the cost of three different sandwiches at Marks & Spencer in St James's Hospital, Leeds with the company's Briggate branch in the city. The sandwiches were all about 15% more expensive. A ham and cheese sandwich that cost £2.50 on Briggate was £2.90 in the hospital branch. Katherine Murphy, chief executive of the independent charity the Patients Association, said the higher prices were "just morally wrong". "I am shocked because they are targeting the wrong people; poorly paid staff and patients. It is wrong to take advantage of a captive audience." The association would support the matter being raised before the Health Select Committee, she added. WH Smith said: "Locations such as hospitals are more complex environments to operate in, with certain operational costs being significantly higher than on the high street, for example longer opening hours, more complicated delivery arrangements and often higher occupational costs." Marks & Spencer said prices in hospital "could be a little higher due to the increased running costs necessary to cover longer opening hours and convenient location". Iain Brodie, for Mid Yorkshire Hospitals NHS Trust, said pricing policy was a commercial decision by WH Smith. "The trust has a number of free-of-charge water dispensers in our public restaurants and cafes for visitors, staff and outpatients", he added.